Hawthorn Sheltered Housing Residents with SFRS Area Manager for Glasgow George McGrandles and SFRS Officer Fiona Herriot (seconded to ng homes) and Sheltered Housing Support Officer Chris Quail. 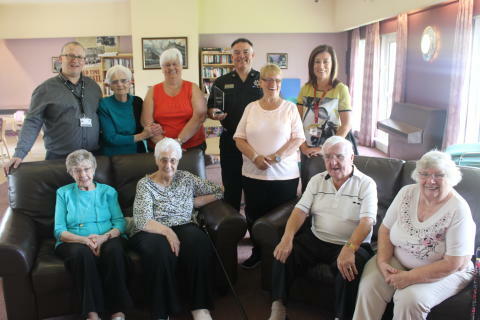 WORK being carried out by ng homes and the Scottish Fire and Rescue Service to manage the risk of an ageing population in North Glasgow has been recognised with a UK wide award. The Partnership Award which was won at the Alarm Risk Awards 2016 recognises excellence in public services and communities. Over the past year ng homes has been working in partnership with Scottish Fire and Rescue Service (SFRS) to identify creative ways to engage with the community to mitigate risk and develop a collaborative approach within specific areas. A key focus of their work is with Scotland’s ageing population who have been identified as a particular ‘at risk’ group in terms of fire fatalities and casualties. The partnership also targets its resources around areas of ‘unintentional harm’, much of which is related to falls, particularly with the elderly group. SFRS Officer Fiona Herriot is seconded to ng homes and works with their frontline staff to ensure systems and processes match the strategic and community focus of the approach. Fiona delivered fire safety awareness training for housing and regeneration staff, including concierge who are on 24 hour duty at multi-storey flats. Fiona said: “We had already undertaken various areas of working together in the community in terms of raising awareness and education about issues around fire. SFRS have provided valuable input to ng homes on specific areas including emergency access to new car parks at the multi-storey properties and the mechanisms and doors chosen for new close door entry systems. They have also supported ng homes community programme which sees 60 older people at a time visit their local fire station for ‘Afternoon Tea’ where they receive a talk on fire safety, tea and entertainment and have the option to sign up for Home Safety Visits. The awards form part of the Alarm National Conference which is the highlight of the risk management year and they recognise the excellent work of risk and insurance professionals throughout public and community services across the country. Also in ng homes category were Fire & Rescue Indemnity Company Limited and the Fire and Rescue Risk Group (FARRG) who were highly commended. Other participants included Essex County Council and Essex County Fire & Rescue Service, Supply Chain Resilience Working Group part of the Insurance London Consortium (London Local Authorities) and Thames Valley Police who were shortlisted for the Partnership Award.